The 2001 census recorded 29 individual languages as having more than 1 million native speakers (0.1% of total population). * Excludes figures of Paomata, Mao-Maram and Purul sub-divisions of Senapati district of Manipur for 2001. ** The percentage of speakers of each language for 2001 has been worked out on the total population of India excluding the population of Mao-Maram, Paomata and Purul subdivisions of Senapati district of Manipur due to cancellation of census results. 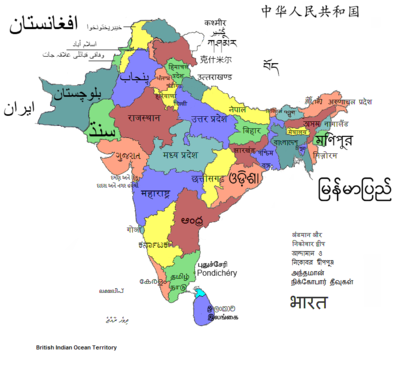 ↑ includes Western Hindi, Eastern Hindi, Bihari languages except for Maithili, Rajasthani languages and Pahari languages. ↑ includes populations in the parts of Kashmir administered by Pakistan.